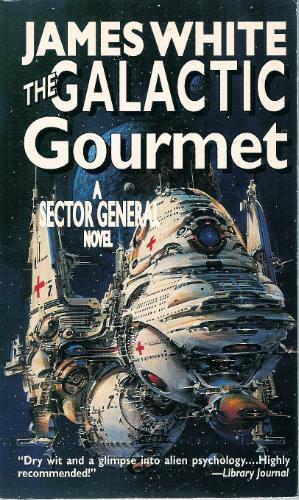 The Galactic Gourmet caught my eye in our local library during an emergency stockpile visit (many book piles at home are of the ‘you must think as you read’ variety – not the most conducive to pain mgt!) I had not heard of James White, but liked the description of Gurronsevas, a massive, 6-legged, elephant-likeTralthan chef who takes on the ultimate challenge as Sector General’s new Chief Dietician: making hospital food palatable. How Gurronsevas redeems himself while hidden away from Col. Skempton on an emergency mission of the Ambulance ship Rhabwar, with friendly help from able crew Dr. Prilicla, Pathologist Murchinson, Dr. Danalta, and Charge Nurse Naydrad is inspiring … and absolutely HILARIOUS! I laughed so hard I cried (not from the kidney stones) and kept on laughing to the end of the book. This is Book #9 of the series. I thoroughly enjoyed going back to the first book- Hospital Station- & reading through to the last page of Final Contact (Book 12.) The first six books feature trainee Doctor Conway, an earth-human DBDG who muddles his way through inter-species surgical challenges, interstellar ‘police actions’ and planetary plagues up the hospital hierarchy ladder to Senior Diagnostician. The Genocidal Healer (Book #8) deals with slightly heavier issues – redemption for Tarlan Surgeon Capt. Liorien who, after demanding the death penalty for himself for professional negligence, must find his way personally & professionally – it is my favorite of the series. If you are looking for summer holiday reading, check these out & enjoy some delightful medicine for your ailments: cosmic hilarity at Sector General! This entry was posted in Bookshelf (BOOKS) and tagged Mystery & Mayhem, Sci-Fi. Bookmark the permalink. Va., This isn’t my normal cup of tea but you have me intrigued. Maybe I need to branch out and try something new! –c.